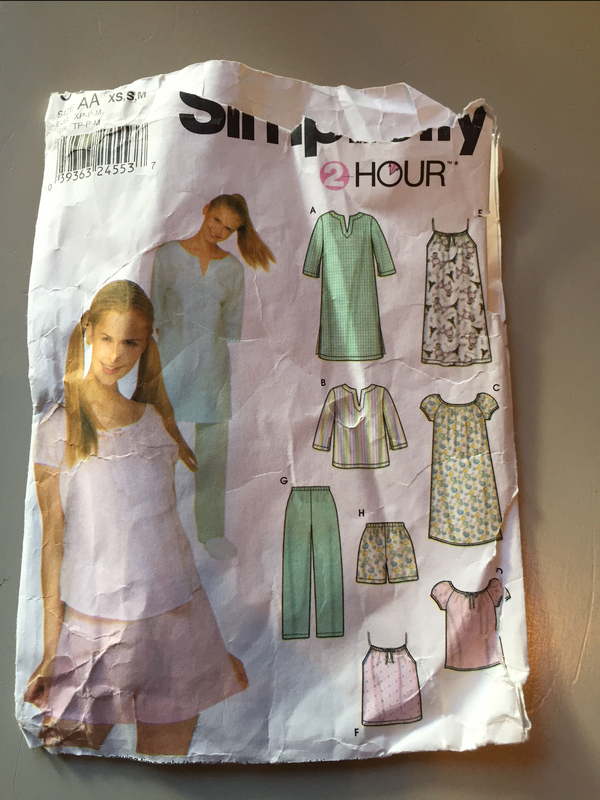 I wanted to sew a nightgown for Patsy for Christmas. Several years ago, I ordered quite a few pieces of flannel on Thanksgiving night from the JoAnn’s website. Then, before I knew it, we were packing, living in a camper, moving into this house and my fabric was stacked in the shop, in bins. I am now able to access it easily, and pulled this piece out for this project. I started with this really old pattern. I’ve used it time and time again. But this time, I wanted something a little different. I cut view C, but made the bottom straight instead of curved. I also widened the skirt out quite a bit, tapering from the armholes down to the skirt bottom–I probably added 4 inches on each side to give it some fullness (so that’s about 16 extra inches of fullness because I cut it on both front and back). Then, I cut a wide ruffle about 1-1/2 times the measurement of the skirt bottom, which I gathered and sewed onto the bottom. It went together quickly and my only concern is that I cut that ruffle too wide, and the nightgown will drag on the floor. That’s easy enough to remedy, if that turns out to be the case–flannel usually shrinks, so after it is washed a few times, if it’s still too long, I’ll cut it off and re-hem it. 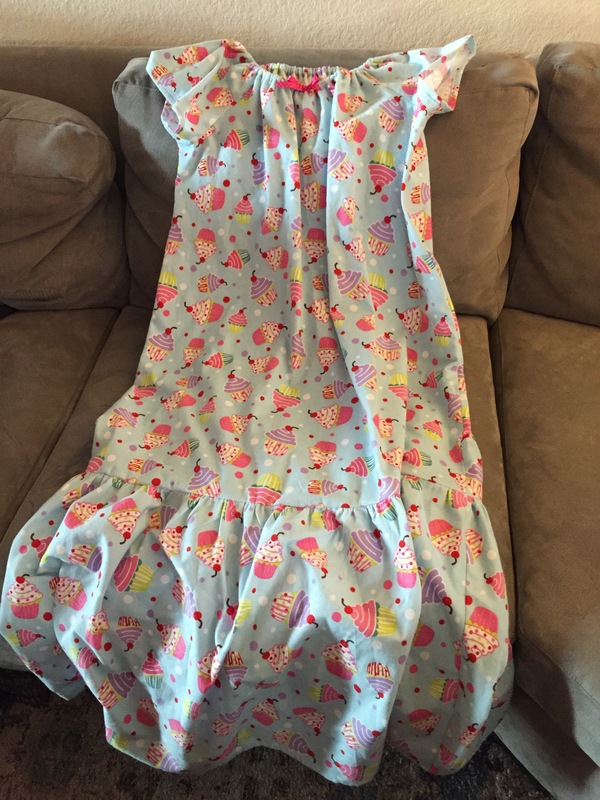 I always put a ribbon bow on the front of these nightgowns to show which side is the front so getting ready for bed is fast and easy. I was delighted to get another Christmas gift finished up, and used up a piece of fabric I’ve had for quite some time. Even better, it’s something she really needs right now. However, as has been happening lately, I ran out of pale blue thread. When I saw that was going to happen, I sewed everything that would show–the hem, the casing, etc. Then, for the gathering threads, which I was going to throw away anyway, I used a bobbin of a totally different color, with the last bit of the pale blue on the spool. It worked out, and I avoided a trip to the store today, saving both gas and money. I will replace that color soon, to have on hand, as blues are something I use a lot of, the next time I’m near JoAnn’s. This was a week of projects. We were able to get a ton of them done, as we did not need to watch the kids. 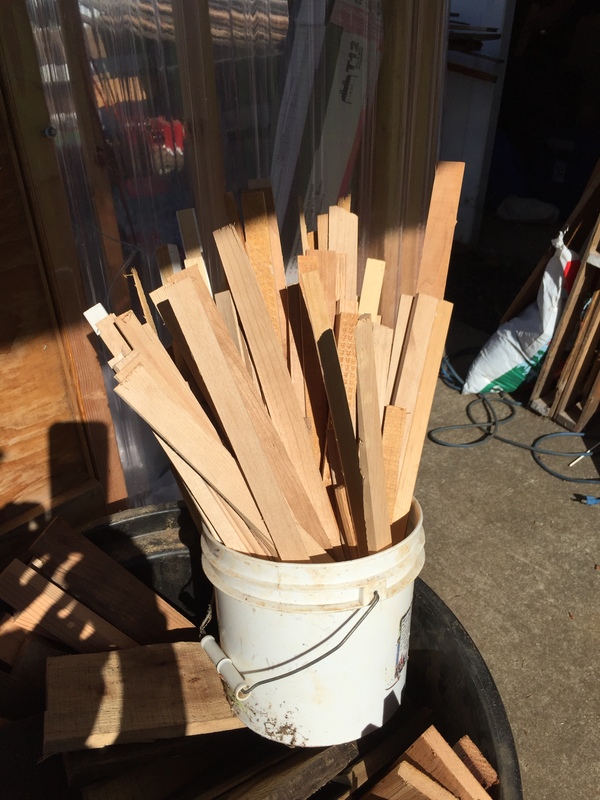 One day, we worked together all morning to cut kindling from a large pile of boards we had picked up for free during the past few months. I held the long boards and Rob ran them through his saw. We got several large garbage cans full and several cardboard boxes, which we stacked in the greenhouse to keep them dry. All the wood our friends brought us is now stacked in the woodshed. There are just about 5 pieces that need to be trimmed to fit our stove, and that project will be finished. There is another load, though, and we are super excited to know it’s on its way one of these days–that will give us enough for the winter. Rob repaired the roof of the greenhouse. He built it last year for me and used some plastic he had on hand. It wasn’t the correct plastic and it disintegrated during the past few months. He ordered the correct one, and installed it this week. It was still great to get a season out of some plastic that was otherwise not being used. 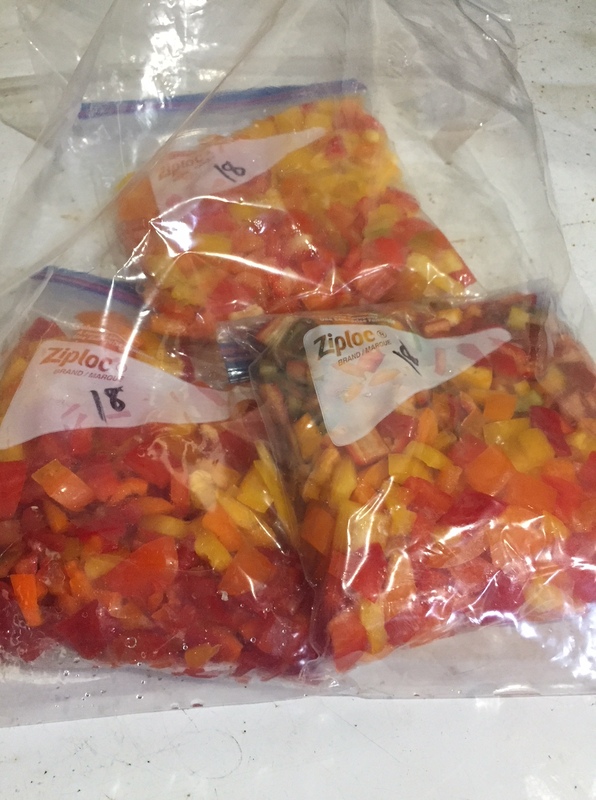 I got some peppers from the mark-down bin at Fred Meyers and cut them up to freeze. I added some peppers I picked in the garden as well. My peppers have not done great this year, but I will pick a few more before this season is over. 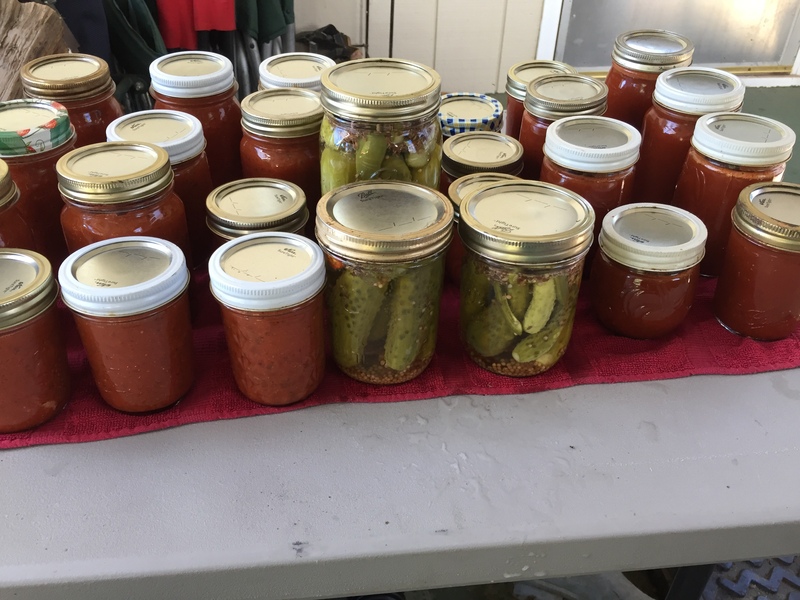 I also canned more tomato products this week, and another small batch of pear butter with the last of the pears from the tree that fell. 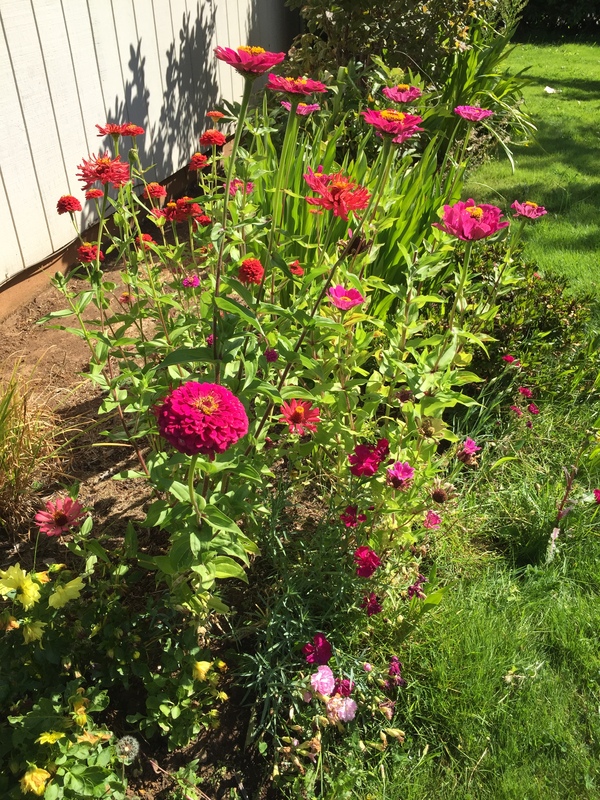 The zinnias are blooming in several places in the yard. I love them. I found a few places where I may be able to save some seeds from them. I’m wondering if the clove pinks below them will come back–or if they will die this winter. Sometimes the dianthus family is quite hardy. Time will tell. They are from seeds my sister brought my mother from England, and I grew them in the greenhouse. We got so many, my mother shared with me, and my sister, and now we have them in several places. I enjoyed looking at the flowers that are still blooming, despite the dry weather. We did get a little rain this week, and I’m sure they all relaxed a bit! The nasturtiums came up volunteer this year, and it looks like they are dropping some seeds. Maybe next year, I’ll have more! 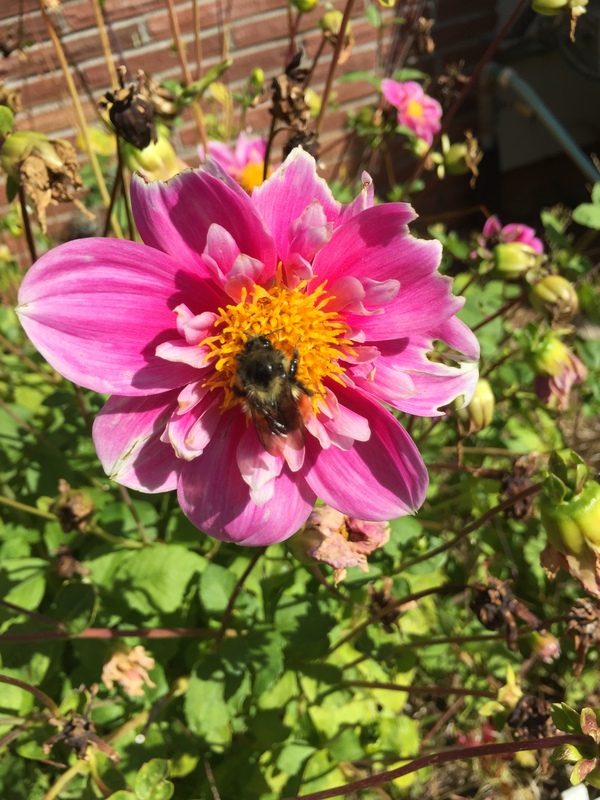 There have sure been large bees on my flowers this year. 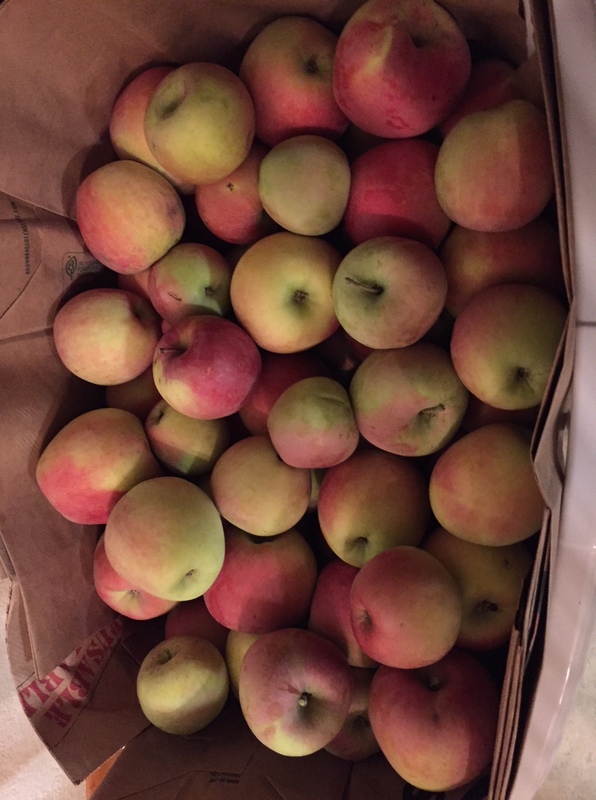 My niece brought over a large box of apples from her mother. I’m excited. They look and taste great. The family has already been munching away on them. I probably will preserve a few if it seems like we won’t eat them all fresh. Fun! We cashed out part of the Ibotta account and used the money for an order from Azure Standard. I ordered some cleaning supplies and soap for Rob since he doesn’t handle many soaps, but the goat milk one agrees with him. I got bulk gf oatmeal, a lot of spices, salt and pepper, and more. It was great to use rebate money for basic items I needed. I shopped the sales and purchased some things like sugar, produce, milk, etc. I got several free things such as French bread, several drinks, and a ready-to-eat dinner. I had a very nice visit with Harnet and Danait. We just hung around their place, ate, visited, drank coffee and took Danait out for some air. It was good to catch up with them as I’ve been pretty busy this summer, and haven’t gone up there as much as I wished to do. Because I went alone this time, Danait thought I should play with her as there were none of the girls to play with. Thankfully, her mom had a meeting with a lady there at the house, and Danait and I played and played, satisfying her, at least for a little while. We fed the dolls, played “Baby Jesus in a manger”, took all the dolls to the hospital and fixed them up, she found broken toys to send home to “Uncle Rob” because he fixes things, and put blankets over our heads and howled like ghosts for a while. It was truly entertaining, the things she thinks up! Thank goodness for Harnet’s nice, strong coffee! We ended the week feeling quite good about what we got accomplished, and are now ready for a busy, busy week watching the kids and keeping life going. How about you? The 11 little jars on the right are the enchilada/taco sauce. I was asked how I made it, and if it was a secret recipe. The truth is, I am writing it down for my self as much as anyone else, because if time passes, it will be a secret–I won’t be able to remember what I did! This is my second attempt at enchilada sauce this summer. The first one was good, but we wanted a little more spice and a smoother texture. My pamphlet from the county extension office states that you can change the spices without affecting the safety of the finished tomato product, but nothing else, so that’s what I did. I took a large bowl of tomatoes and washed and cut them up. Then, I put a layer of them in a pot on high and crushed them with a potato masher while they cooked. When that layer was softened, I added more cut-up pieces and kept crushing and cooking until the pot was about 3/4 full. You have to keep stirring, because this will stick and burn if you are not careful. Then, I put these cooked tomatoes through my Foley Food Mill to get the seeds and skins out. I put that puree back into the pot. 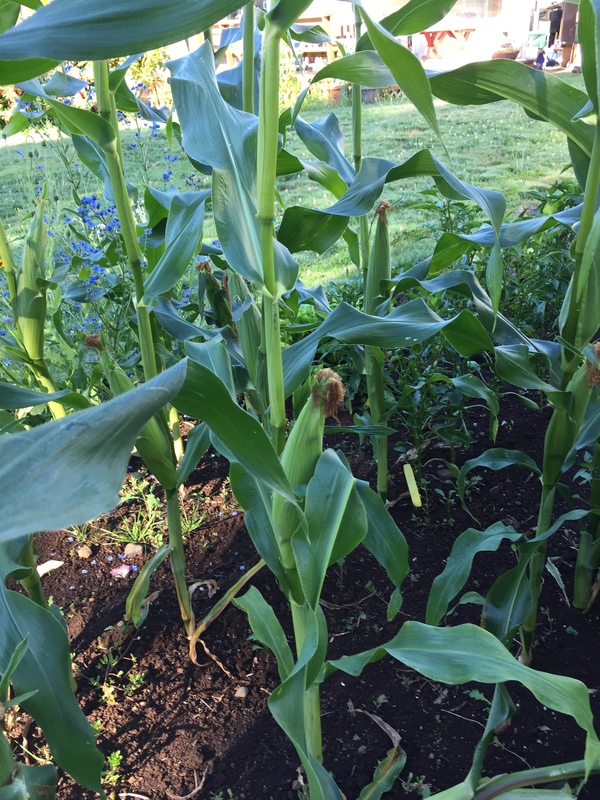 At this point, it was nice and smooth, mostly seed-free, but pretty runny. I thickened it up with a combination of cooking it down and added some tomato paste until it was the consistency of taco sauce such as I would buy at the store. Our favorite is La Victoria, and we usually get the mild, but sometimes the medium. I used about 2 cups of paste in the large pot that was 3/4 full, but then it was too thick and so I had to add some water to thin it slightly. If you are making this, the amount of paste you will need depends on several factors, which include the dryness of your tomatoes, the variety of the tomatoes, and the amount of time you cook the tomatoes down before you add the paste. Use trial and error until you reach the perfect consistency. Each time you make it, it is likely to take a different amount because the tomatoes are so variable. Taco sauce should be thicker than tomato juice, but not as thick as pizza/pasta sauce. We buy our tomato paste for these kind of projects at Cash and Carry in the gallon cans. 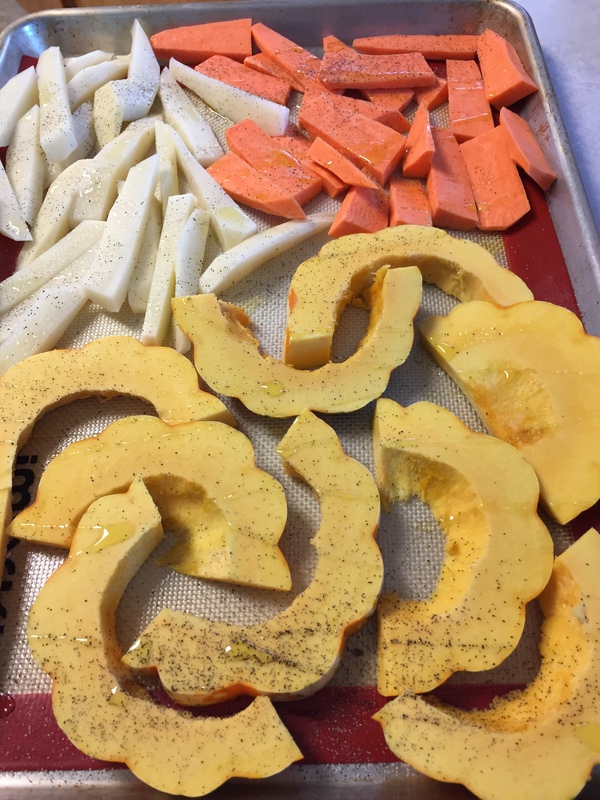 I open the can, use what I need and then freeze the rest in baggies to use over time. It is a real money-saver to purchase it that way instead of little cans for 50c-$1 each. The last time we bought a can, it was slightly dented, and cost around $3, but it is usually a bit more than that. Still a great deal. This is my best guess at the spices I added to the pot: 1/4 cup mild chili powder, 2 Tablespoons dried oregano, 1 Tablespoon dried cilantro, 1 teaspoon garlic powder, 2 Tablespoons ground cumin, 1 Tablespoon salt, 2 teaspoons pepper, and 1/2 teaspoon – 1 teaspoon cayenne pepper. The truth is, I was putting in spices, tasting, adding more spices, tasting, etc. until it tasted right to me. The chili powder, oregano, etc. added an underlying layer of flavor but there was no zip at all, until I added the cayenne. It is not very spicy, just enough to give a little kick. When I make it again, I will start with this mixture, then add more of those same spices and/or salt if I don’t feel like there’s enough. 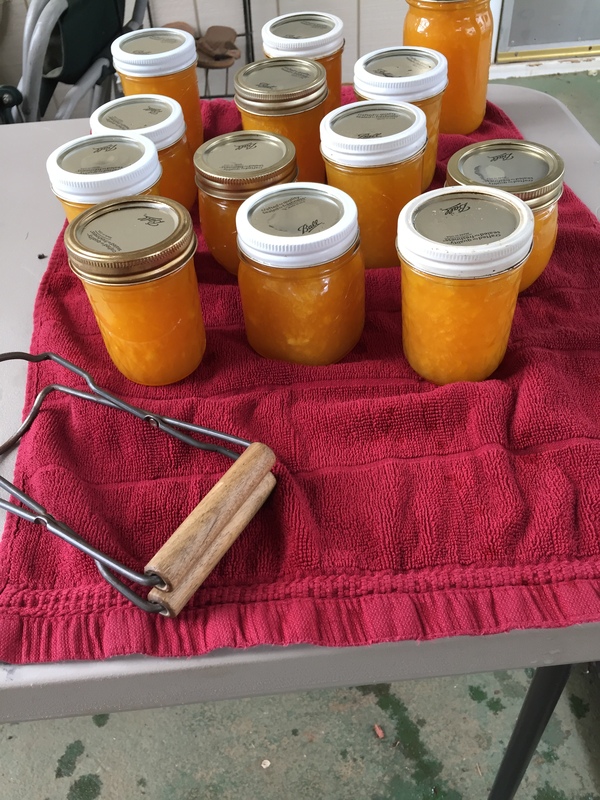 I put the hot mixture into the jars and added 1 Tablespoon lemon juice to each larger jar (not quite a pint) and 1/2 Tablespoon to the 1/2 pints. Then, I canned it for 35 minutes in a hot water bath canner, as instructed in my Ball Blue Book for tomato sauce. This yielded the 11 assorted jars in the right hand side of the picture above. If I get enough tomatoes, I might make this again this year. It turned out yummy and we are already opening and eating it:). At this rate, it won’t take long to use up those 11 jars! We had a wonderful get-away camping at the beach. Other than one sandwich Patsy and I grabbed at Subway, we cooked all our meals in the camper. We tried to keep things easy, except for a few special meals. One morning, Patsy and I went down to the bay and we were able to get these Cockle clams. 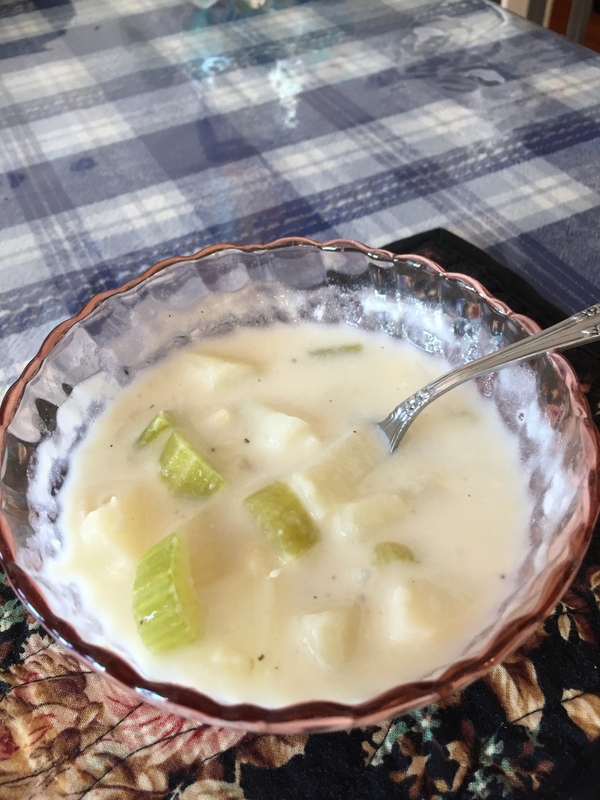 I turned them into the clam chowder pictured above. We have enough frozen for one more batch in the near future. 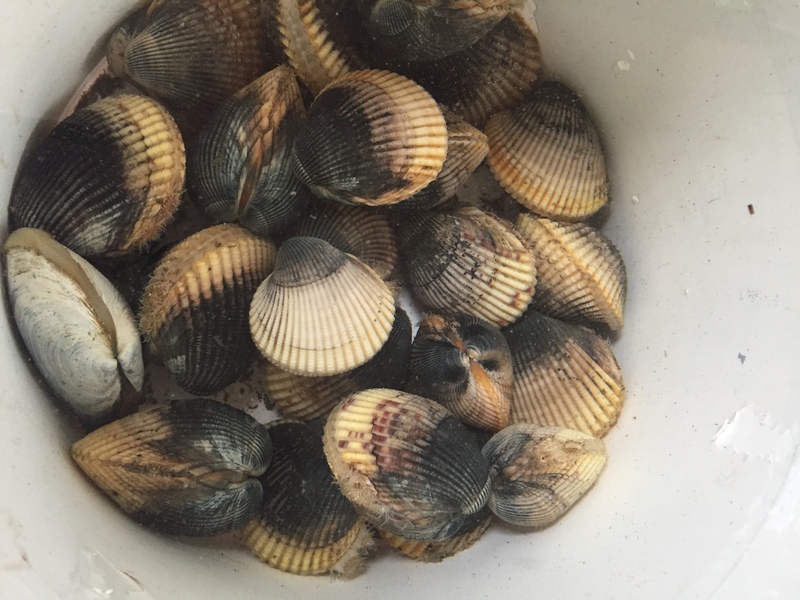 It was our first time hunting for these kind of clams, and I got some extremely helpful advice from a man down on the beach, who showed us how to get them. You are supposed to rake them, but we did not have a rake, so we scraped our shovel along the sand, and Patsy was even raking through the wet sand with her fingers, and we found over 20 between the two of us. They seem to be found more frequently in places where the seaweed has been deposited by the tide. We went crabbing off the docks in Newport twice. Thankfully, we found great parking spots that were very near the dock, and didn’t have to carry our gear very far. 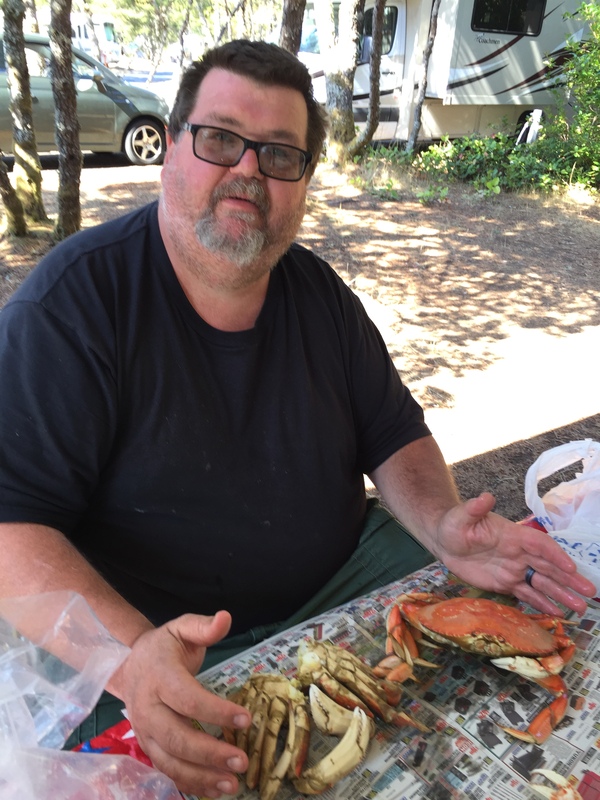 The first day, we got these two and the second time we got one Dungeness and kept a couple of Red Rock Crabs just to give us a little more meat. I had crab salad and just plain crab, and froze 2 small packages for the near future. Rob fished off the docks while we waited for him to pull up the traps, but caught nothing. We did foil dinners in the fire one night. The meat, carrots and potatoes turned out great. 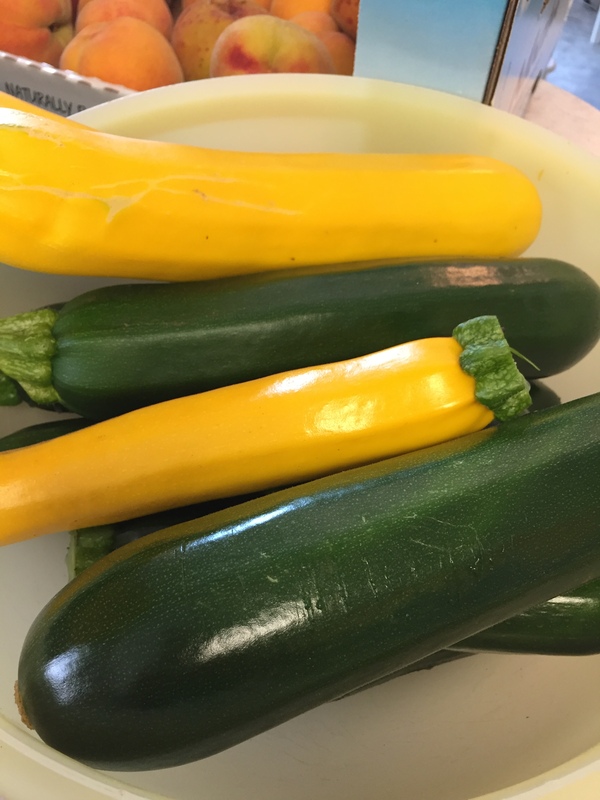 The zucchini turned into mush. I threw it away. There were no takers for that one. I had picked every single tiny one before we left, hoping that they would not take over while we were gone. 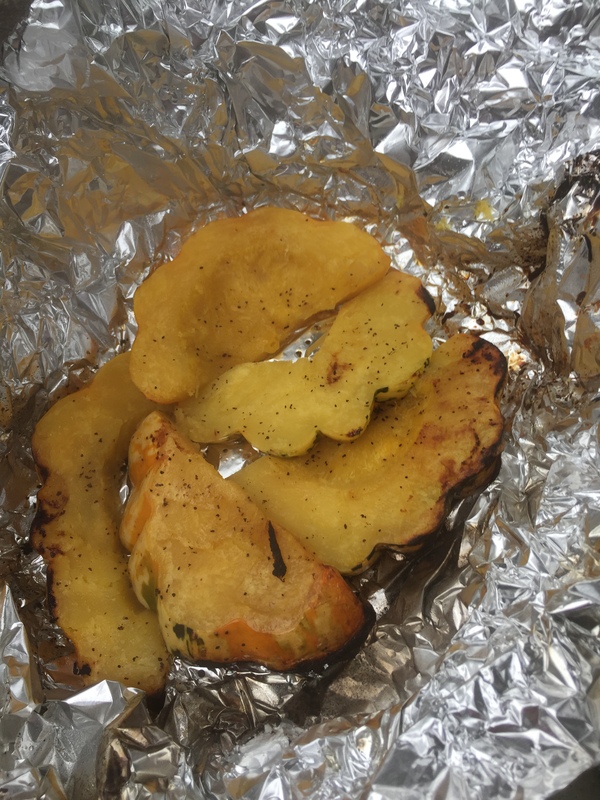 The acorn squash turned out great! 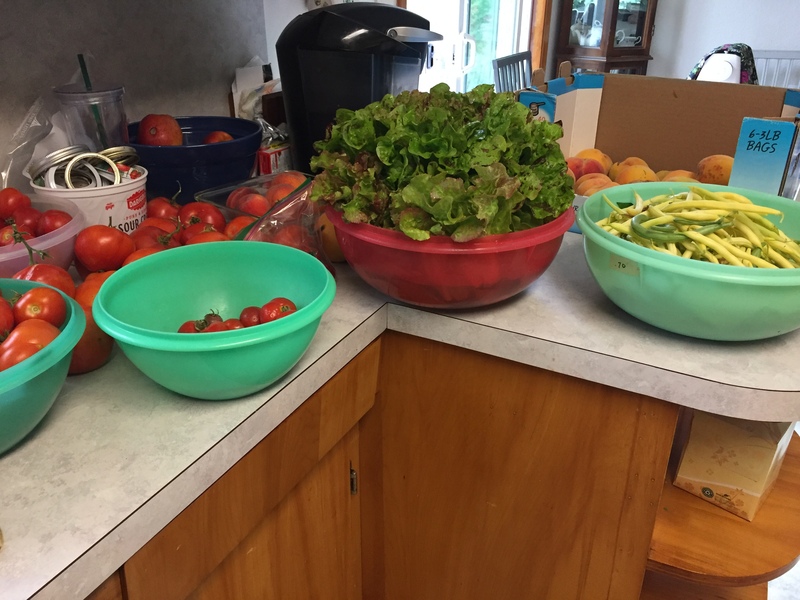 The rest of the meals were salads, lunchmeat and cheese, corn from our garden, lots and lots of tomatoes and cherry tomatoes, and hamburgers one night for dinner. Breakfasts were eggs, sausage one day, cereal, and fruit. Most days, we threw some food into our little cooler and just ate out of that wherever we were when lunchtime came–dock, jetty, etc. We had a great time, and ended up the week by purchasing tuna off the docks to can, It was an unusual menu compared to what we more commonly have at this time of year, but I love seafood and will remember for other times when we can’t catch anything. .
We enjoyed a wedding yesterday afternoon. This is the car they drove away in:). 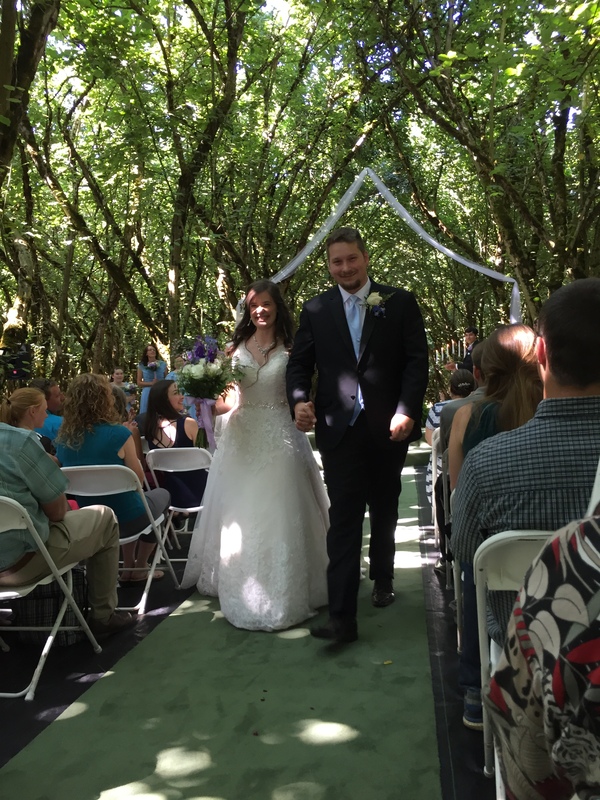 We enjoyed seeing many friends we had not seen for a while, the beautiful bride in her gorgeous dress, the handsome groom in his suit–a young man we’ve known and loved since he was 5, the cool breezes as we sat under the hazelnut trees for the wedding and reception–a lovely venue and a very pleasant afternoon. The rest of the week was not as restful, but it was fun as well! 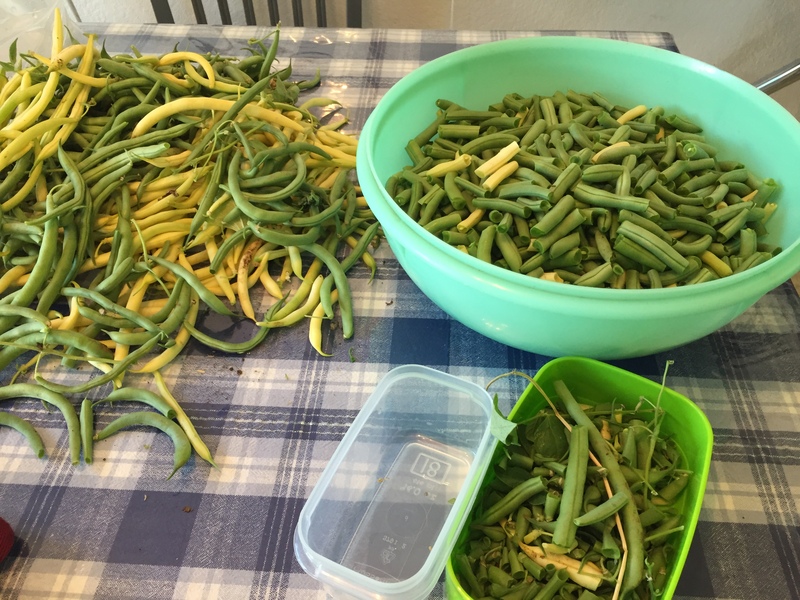 At the beginning of the week, I worked in the garden quite a bit, processing or serving the harvest as I picked it. On Tuesday afternoon, we escaped the heat and drove down to the beach. We did a little shopping at the outlet mall for Patsy, and then just went and sat on lawn chairs and watched the waves. 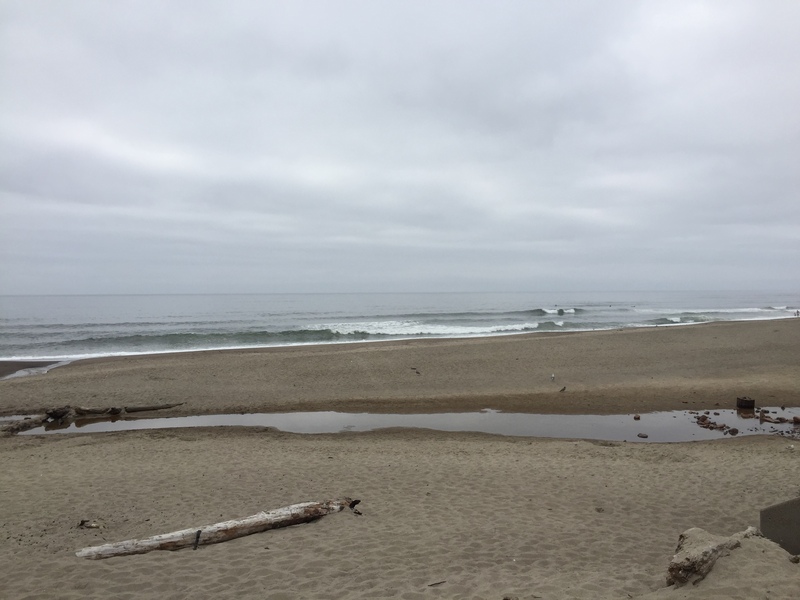 I often forget that beach is only a little over an hour from our house now…we could go more often if I just remembered that it was an option. Since Jake and Michaela spent from Wednesday-Sunday with us, as their parents were out of town, we did a few extra things with them. 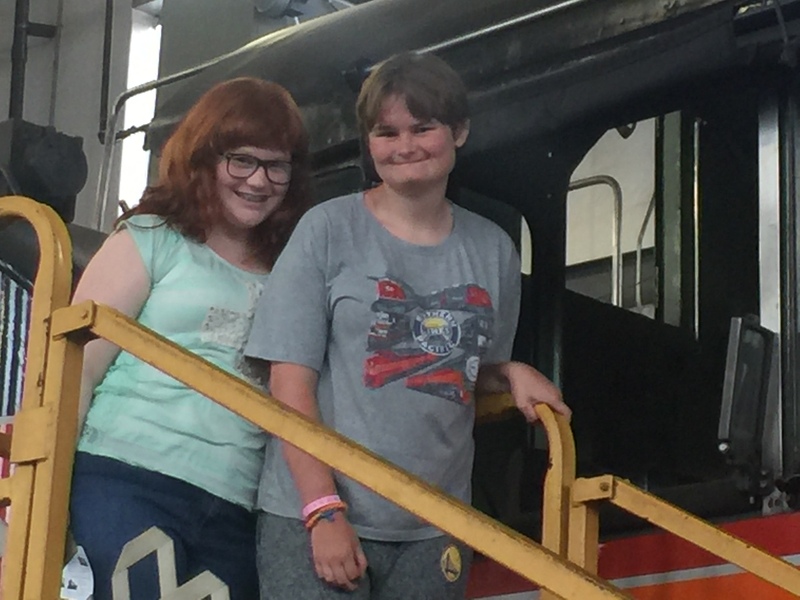 Rob took Patsy and Michaela to a train museum one day, as trains are one of her absolute favorite things in the world. It was free, not very big (so not overwhelming) and they had fun. He also took her to her volunteering opportunity so her schedule could continue uninterrupted. Alissa showed up one evening with popcorn, popcorn buckets and a movie, and we had a movie night. We had a very fun evening, and Jake loved seeing his big sister. I really liked the music in the movie she brought–The Greatest Showman. 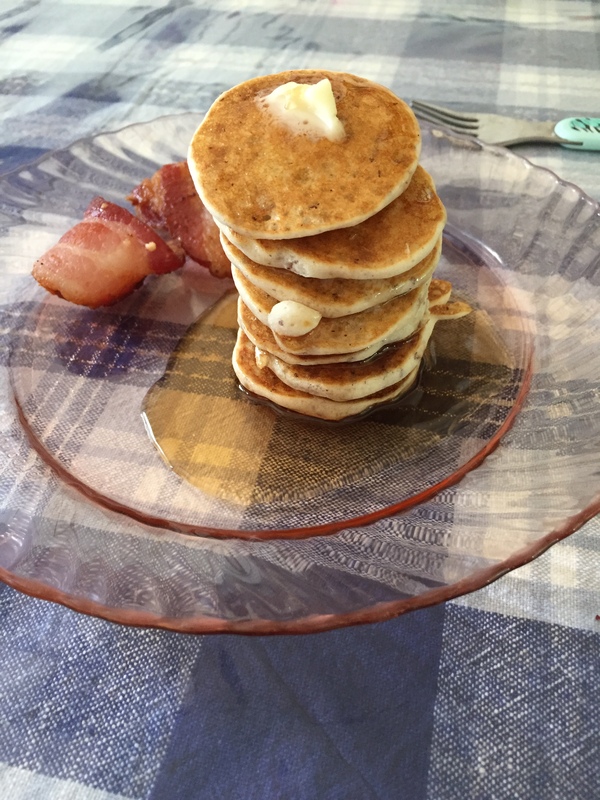 Jake and I are in the book, “The Long Winter”, so one morning I made him “flapjacks” and bacon like Almanzo and his brother ate during the winter storms. He was sure theirs were bigger, and I am too, but he didn’t even finish these, so…..
We went swimming with them a couple of times. We went to the library to check out books and movies. He got another “Betsy” book (by Carolyn Haywood) and we had to read part of that, as well. He likes having the Little House books going on all the time, with Betsy books thrown in. It’s a treat for him to find one at the library we have not read yet. They both did very well, and we were pleased with how it went. 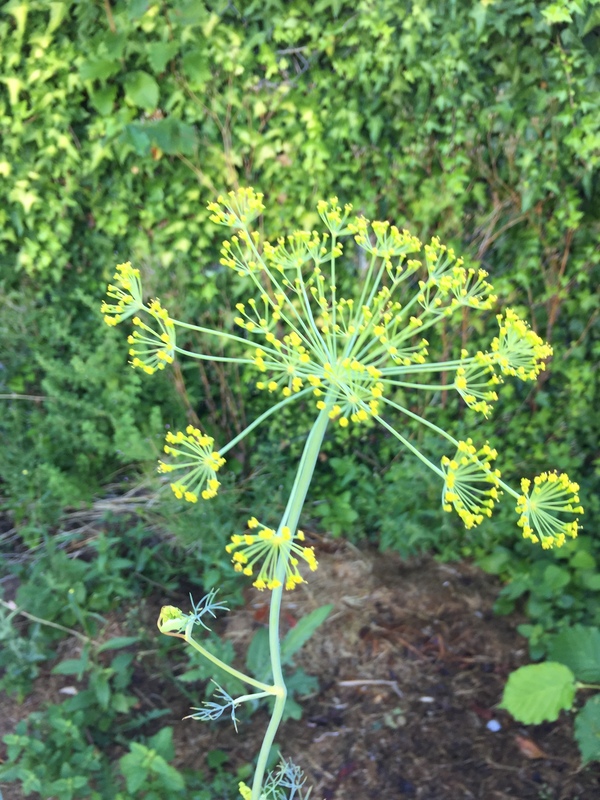 I did get some gardening done, such as clipping off some vines, a little weeding, and Rob tilled up a small area in the garden that was finished and I planted some more seeds–lettuce, spinach, snow peas, cilantro, basil and beets. The lettuce I planted a couple of weeks ago is up, but patchy, as it’s been so hot. 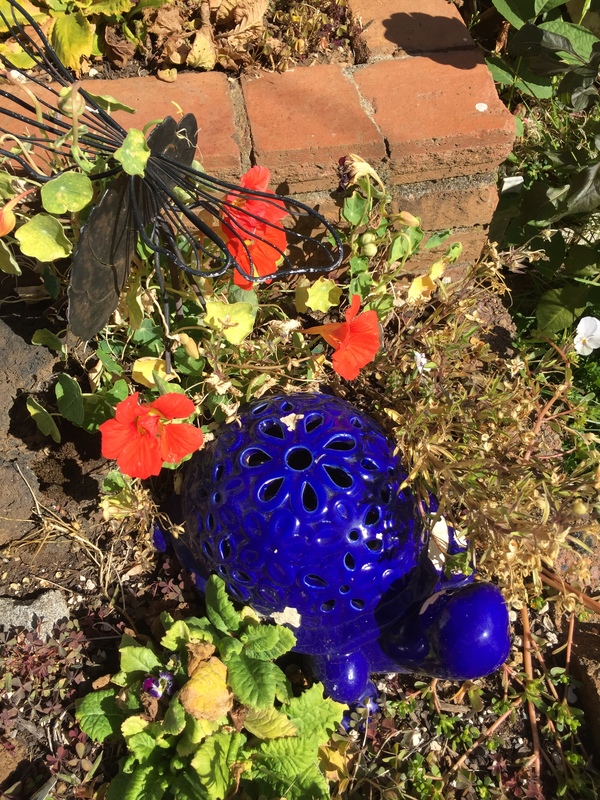 I’ve been out there all morning again today, but, now, I’m going to tear into the inside work as it’s pretty hot out there now. Today’s my only day off for a while, so I have lots I want to do. I have no grocery bargains to share this week, as I didn’t have time to go shopping. I guess that’s the best bargain of all! We are making out like kings and queens with all the garden produce, and things in the freezers and cupboards, so I think I’ll hold off until next weekend, unless we run out of milk. 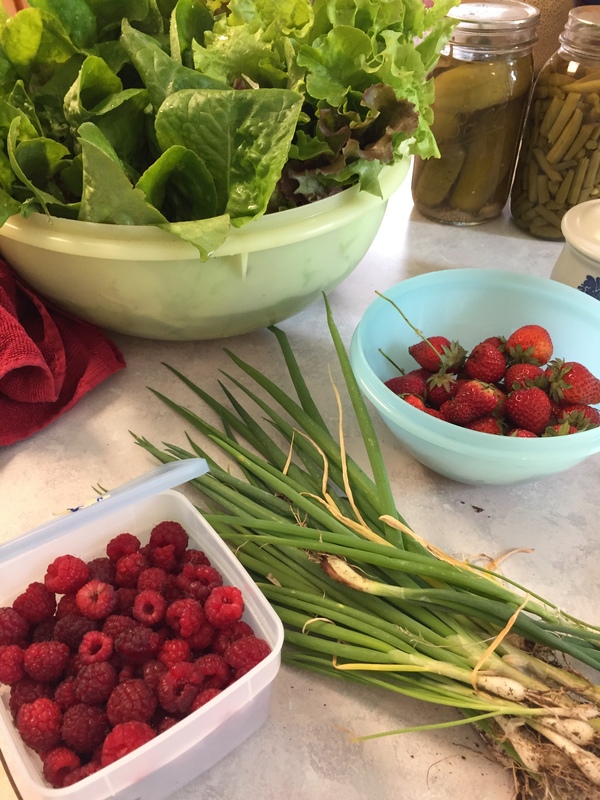 I was able to pick and use strawberries, raspberries, green onions, lettuce and snow peas this week from my garden. I froze a pint of raspberries and there are many more to pick. 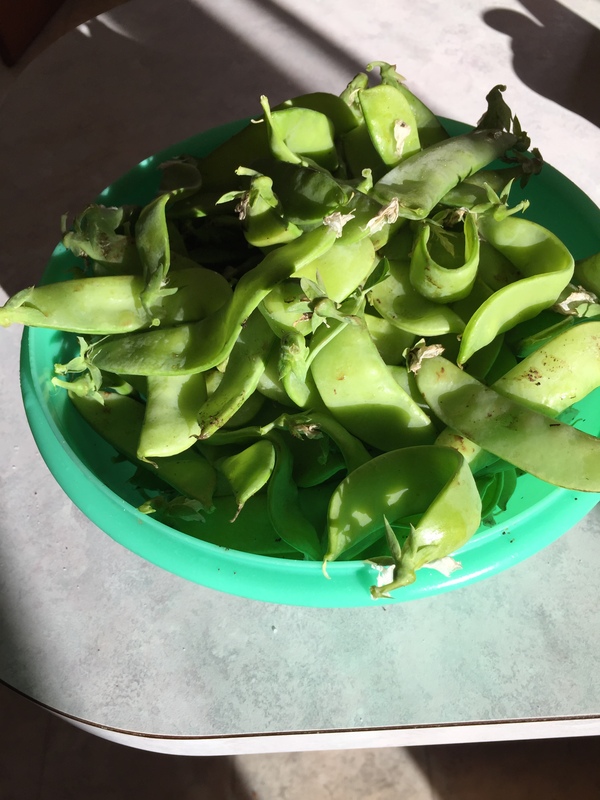 I picked snow peas several times, and got a handful each time, until early this morning, when the bowl just kept filling…I will share some and plan some meals around them for the upcoming week. Yum! For Ja’Ana’s birthday dinner, she wanted pizza, so Rob went to Little Caesar’s and got extremely inexpensive pepperoni pizza and some bread sticks. I ate gluten-free pizza I had made and frozen a couple of weeks ago, saving around $20 or more. Seriously. It costs so much to buy gluten-free pizza from a pizza place around here. Ice cream has been on sale lately, and so I’ve grabbed a few cartons to stash in the freezer for occasions that I know will come up. 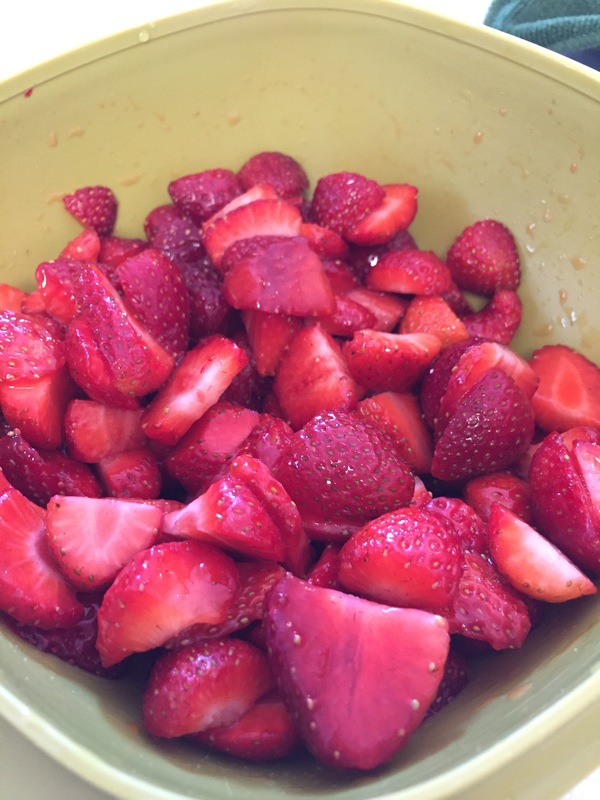 I was able to pick enough strawberries from our back yard to serve with the ice cream. J isn’t much of a cake person, so she was happy with ice cream. I think we attended the last party for a while, last evening. It was lovely. 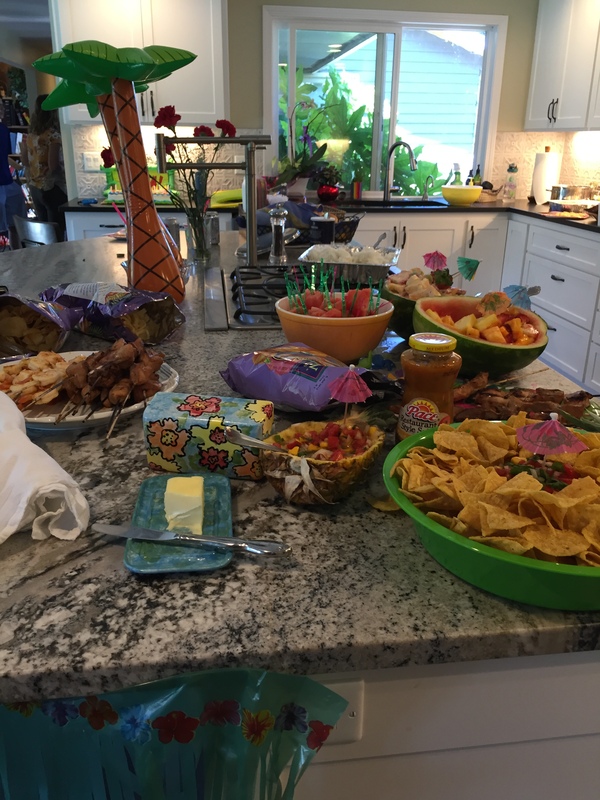 All of the parties have been very fun, and we have enjoyed ourselves. I am looking forward to settling down to normal, everyday life, though. In my room, I’ve been tripping over bags of gifts, cards and decorations now for over a month, and I’m looking forward to cleaning it all up! Most of it has been given out, so that should be quite easy at this point. I cleaned, gardened, did laundry, etc. for 7 hours straight on Friday, at which point I plunked down on the couch and did not move for quite a while. Believe it or not, I could do it again tomorrow–there’s that much to do:). However, I will try to do a little each day, as I don’t have that kind of a block of time available this week. I have been preparing for a backpacking trip on Friday. 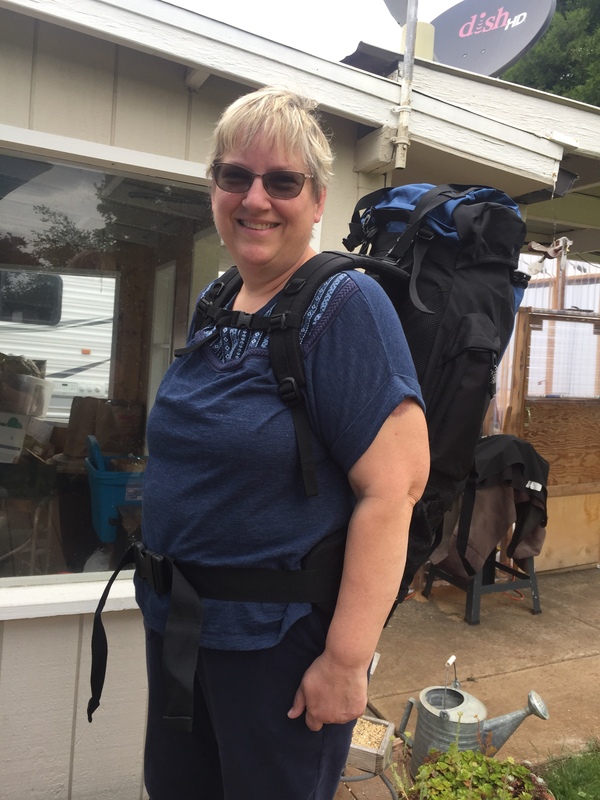 I’ve already loaded the pack part way and have been walking around to make sure it’s as comfortable as can be, and not too heavy. I’ve practiced putting up my tiny, little tent. I’m going with the teen-agers from church, including Patsy and Alissa, and am not in charge, I’m just a woman sponsor. I have absolutely no hope of keeping up with those young kids, so will let the youth pastor and his wife do that. 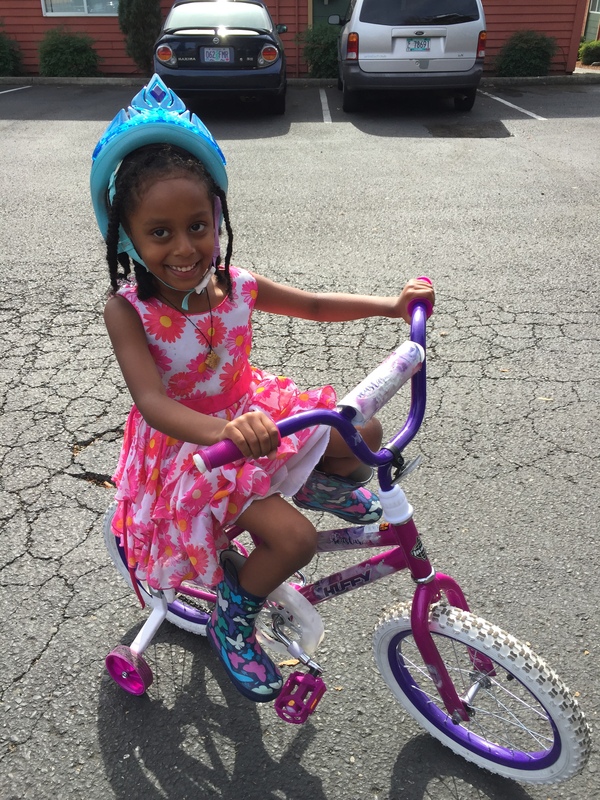 Instead, I will bring up the rear, at my own pace, and enjoy myself, nature, and being with the kids. When I catch up. Possibly much, much later. But, I’ll get there. After all, I’ve been taking Pilates for 9 months now. Right? We have gone through things in the shop, gathering up what I think I will need. I haven’t backpacked for many years, so I’m trying to remember everything I need without being ridiculous. I don’t want that pack too heavy. We bought a few items we think I will need that we did not have. I am taking all my own food. Even though there are some of those freeze-dried meals available that Mountain House donated for the trip, they all contain gluten as far as I can tell. I’m very excited, and will be packing and re-packing all week, I’m sure, in-between working, doctor’s appointments, and so on. 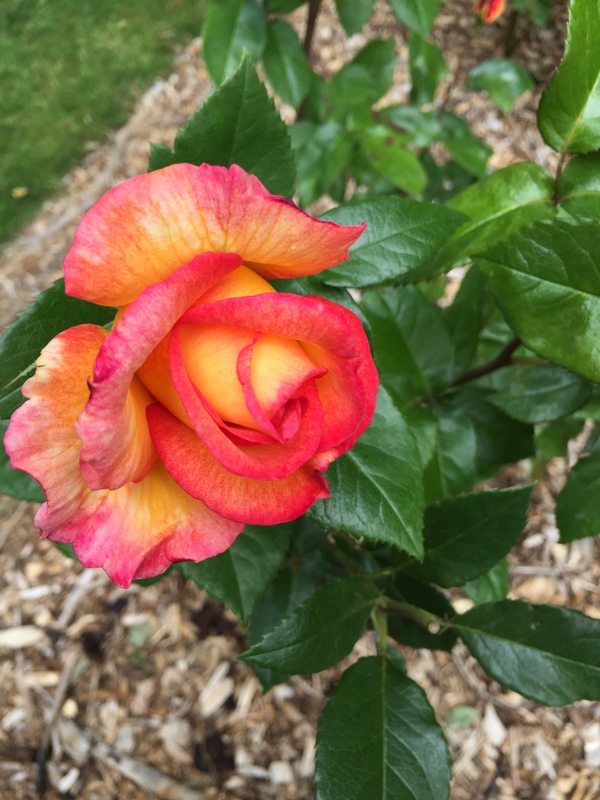 I met up with a friend and went for a walk at a nearby park, which had a beautiful rose garden. We admired the roses, walked a long ways around the huge park, then took off across town to a coffee shop she knew about, where she bought me a sugar-free Italian soda. I had a great time, and really enjoyed the coconut Italian soda, which I had not had before. I thought it was a great thing to do with my first day off from teaching homeschool! Ja’Ana had her last dance recital last night. She does tap. 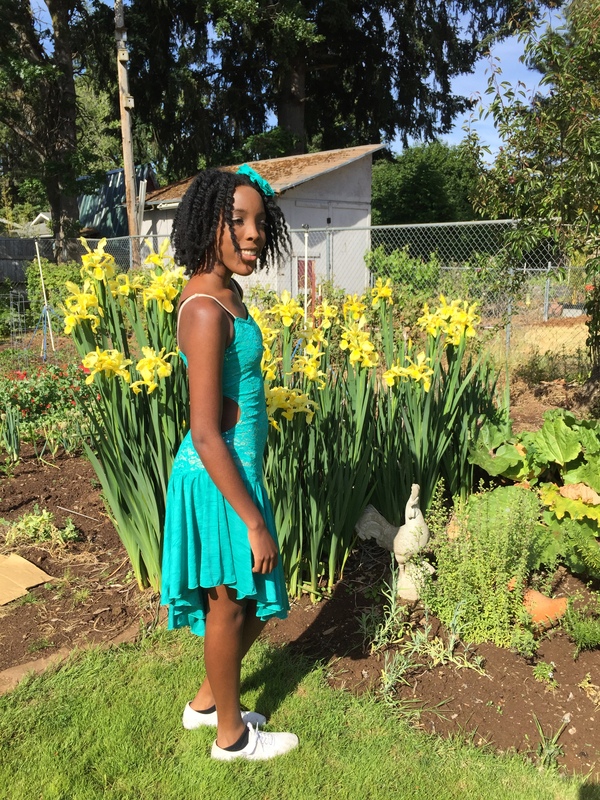 It has turned out to be her favorite kind of dance, after trying many kinds over the years. The recital was lovely, and very tasteful. The frugal part, you may ask? Unless Patsy decides to take dance again, we are done paying fees for lessons, costumes, and gas to get to endless classes and rehearsals! She has had 2 years of dance in the past, but did not want to continue. Every one of the 6 girls had an opportunity to take dance, and most of them did it for several years. That’s a lot of shoes, tights, bobby pins, costumes and leotards. But, it’s bittersweet, because I’ve loved having them in dance! They gave her a lovely bouquet of roses because she is a graduating senior. I turned in all the schoolwork to the diploma program we are going through. Ja’Ana’s diploma was signed, because we got done!!! The last few weeks have been rough, to say the least, getting her to finish up, but it’s done now and she has cheered up tremendously. We all have. Alissa is done with this year’s work as well, but does not graduate until next year. Alissa had a birthday party. This is a custom that they have done for years, as her birthday is in January. When she was younger, it made things much better. 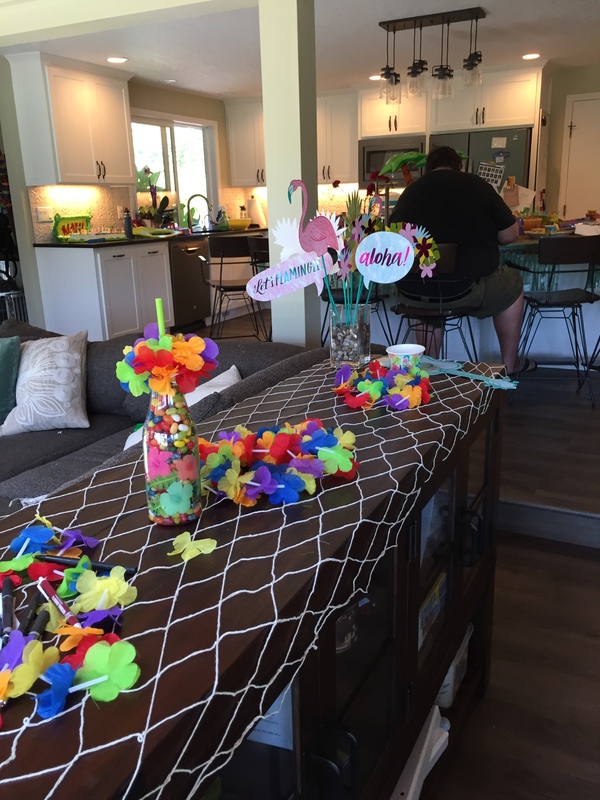 Now, she just wanted to have party, so had a big luau. 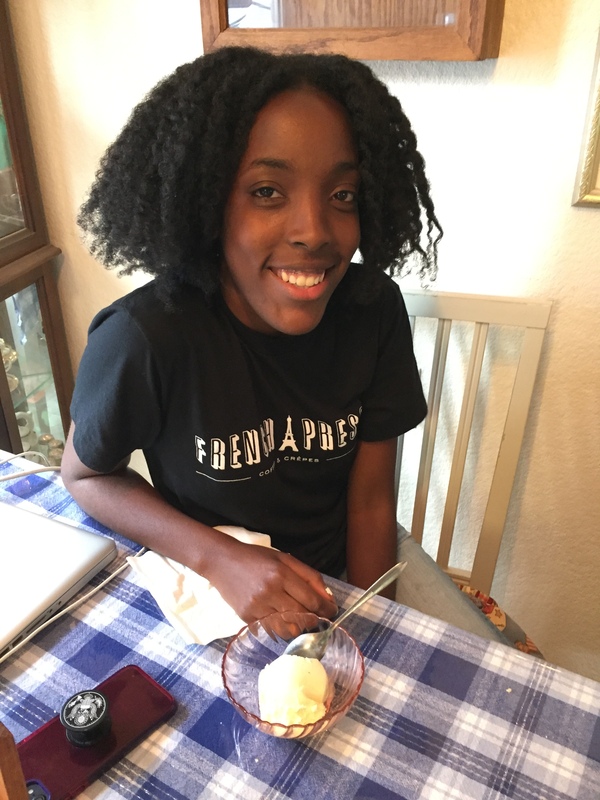 When we dropped Ja’Ana off, I helped out a bit (very little truthfully–they were super well organized), and we ended up eating there. Boy was it good, and we will get the same thing (leftovers) for Family Sunday Dinner–so an easy week for me! There were lots of kids there, and they looked like they were having lots of fun. 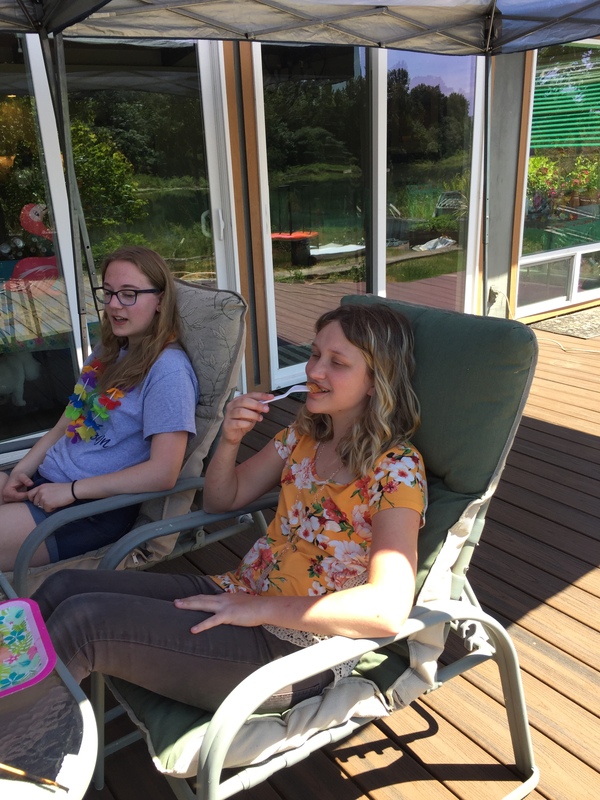 Alissa had planned a few games, but mostly, they visited and ate, as teenagers do. Patsy got an opportunity to work with the high school group for 3 hours, earning money towards camp. 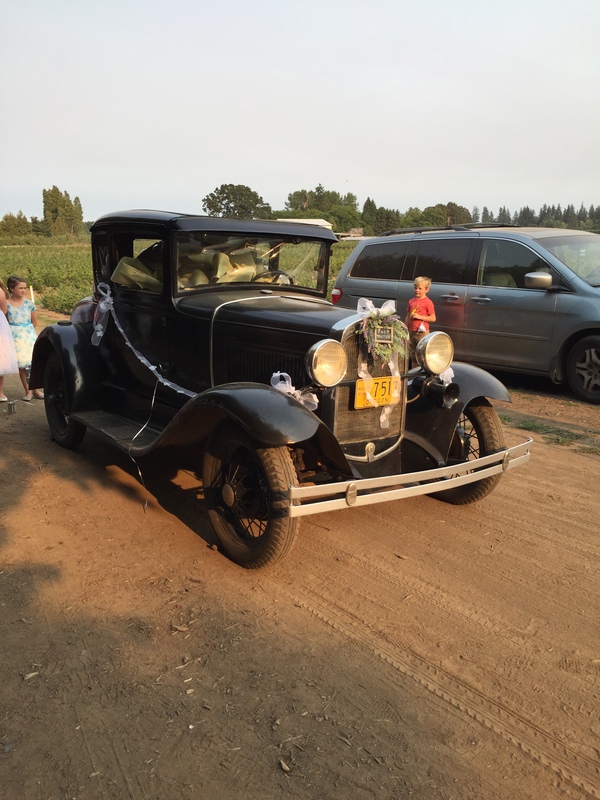 I drove around a lot on Saturday, with 3 events, plus some grocery shopping. I still am grateful that she could earn money. I want to promote that work ethic, and it’s worth some gas to me. I worked a few extra hours. 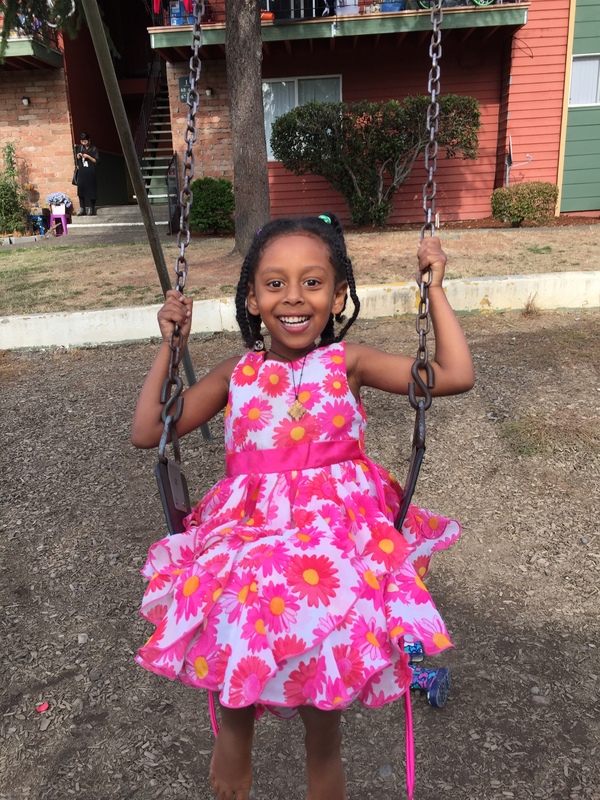 We are still figuring out the best way to serve Michaela’s needs now that she is done with her schooling. One thing we did was have her continue her volunteering work at Meals on Wheels. So, I went down there with her. I would have been happy to help, but they didn’t need me, so I sat down for the time she was there, just being available in case she needed anything. I have been shopping quite a bit more than normal. I have so many events coming up that I need food or other things for: Ja’Ana’s graduation party open house, a dress for her to graduate in (unsuccessful after 2 tries–I hope the 3rd time is a charm), a birthday party for Danait I am helping with later on in June (she and Ja’Ana share a birthday, but she’s turning 4 and J is turning 18), gifts for Patsy, Abbie, Danait, and Ja’Ana’s birthdays, all in the same week, several graduates that we know and love and want to at least send a card to, picnics with the kids, and so on. So, I’ve been scanning the store flyers and the internet and grabbing the best deals at several stores when I see something that will be useful for these upcoming events. I have been working pretty hard at it to stretch my money as far as it can go, and I’m feeling successful. I didn’t have to buy lettuce, as there is some in the garden now, so that’s one thing I could skip! I cleaned a bit more in the garage, and used more odds and ends of food I found lurking out there. 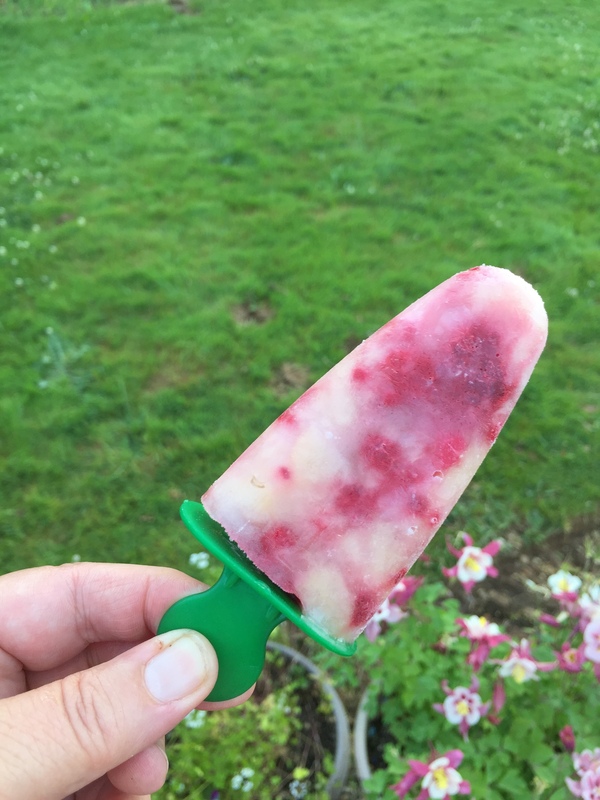 I’ve been using canned pears in more popsicles, along with what ever berries I can grab. Some of those pears have been around a long time, and I’m delighted to find a way to get them eaten! We did more yard work, but did not buy bark dust for the $250 Rob was quoted. We will explore more options, or skip it! 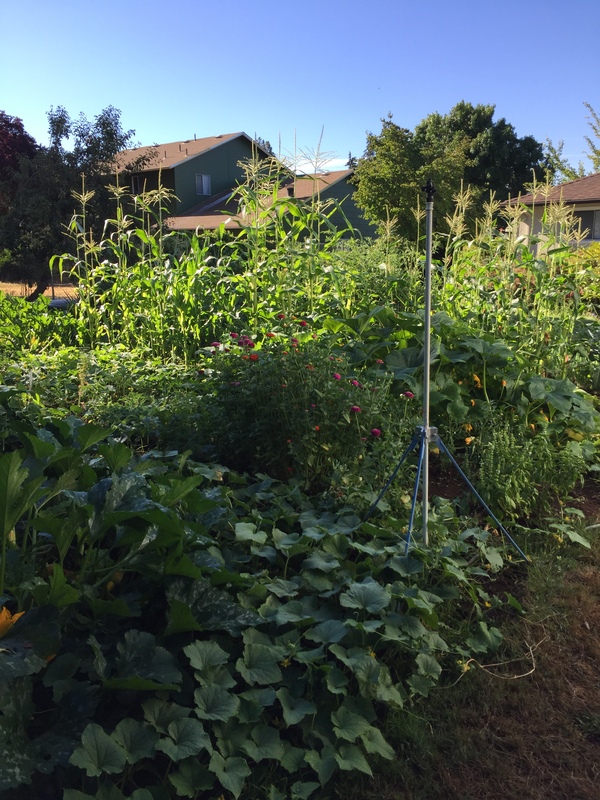 The garden is growing well, but that’s for another post. This one is getting too long, and I want to go to church:). I hope your week was as satisfying! 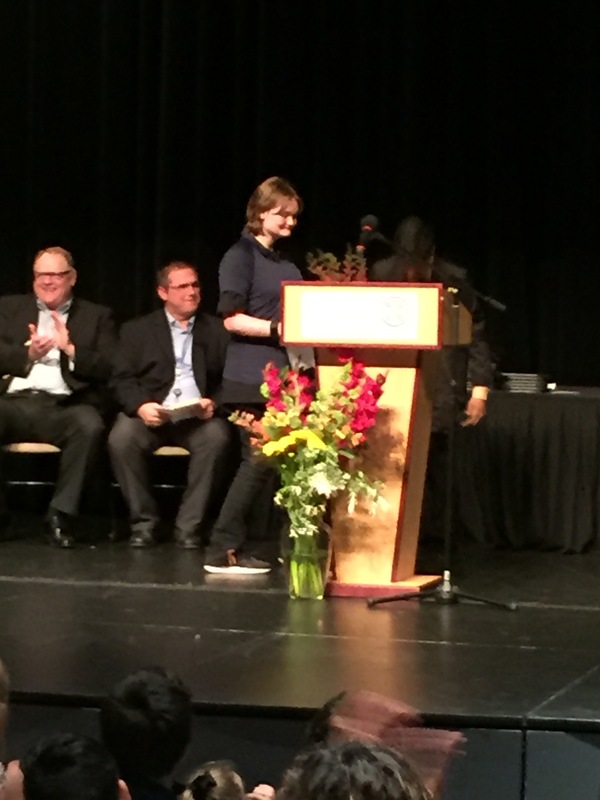 We got to watch Michaela graduate from her program at school. Not only that, but she was chosen to give a speech for the entire graduation. There were only 2 who did, and she just marched up there and gave that speech. She was amazing! She did not seem scared or nervous! Of course, afterwards, the family who attended ended up at Dairy Queen, her choice. 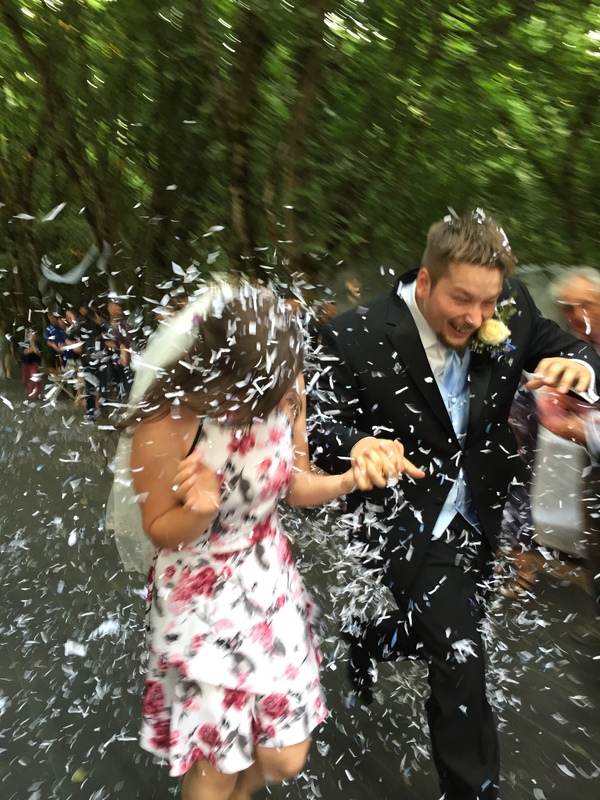 We did lots of fun things to celebrate the occasion. She went with me and we picked Patsy up from school so she could attend the graduation. I took them to McDonald’s and used my app to buy them each a McFlurry (buy one, get one free). Her mom took her swimming and out to McDonald’s for nuggets and fries. Then, to end the day at DQ? A perfect day with perfect meals in her eyes. 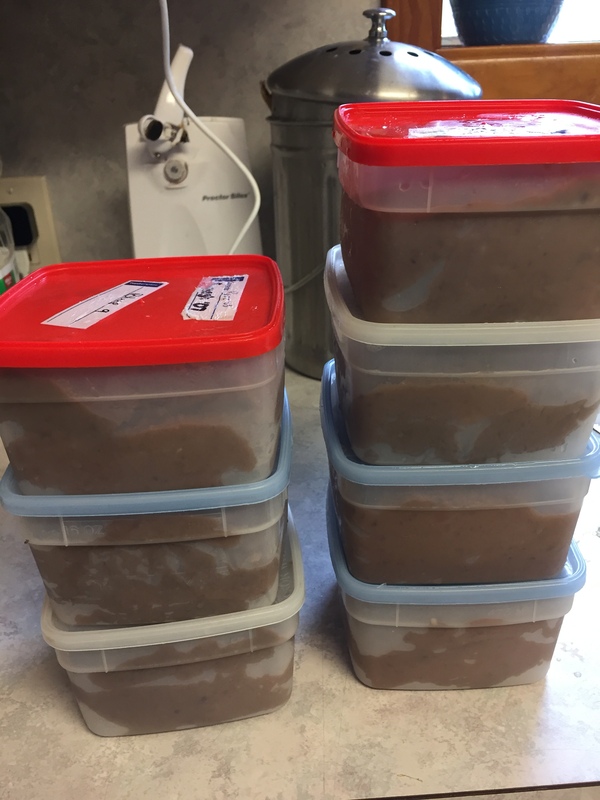 Saturday, I finished up my bean cooking project by putting the refried beans into cartons and freezing them out in the shop, where the big freezers live. I ended up with these 7 pints, plus a couple more that are in a bowl in the fridge to eat this week. It was very satisfying to be able to get that done. We really, really prefer the homemade ones to the ones from cans. We ate chili dogs for lunch, making a big dent in the chili. 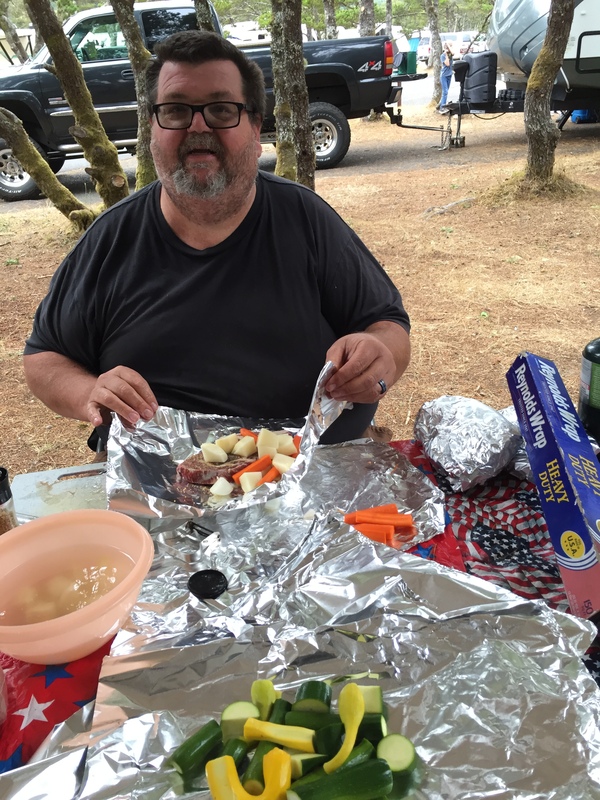 I did cook a few more things as well on Saturday: Potato salad, rosemary and olive oil roasted potatoes, and pasta salad. The salads were for family Sunday dinner. We ate the potatoes with some steak Rob bbq’d on Saturday, and he did more steak and some chicken legs for Sunday. We had a few more family members than normal on Sunday, as we were celebrating several birthdays. I worked in the garden quite a bit. 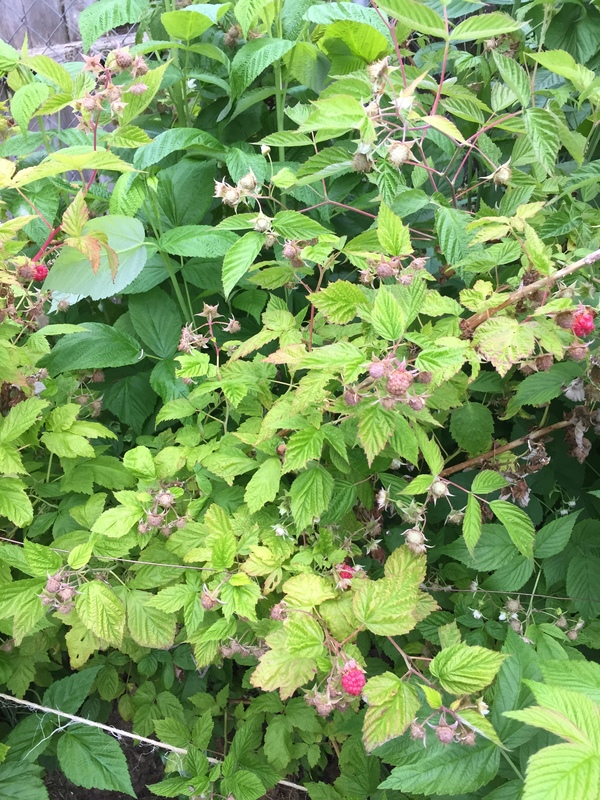 The raspberries are starting to get red. But, the 2 I ate were extremely sour, so I am willing to wait a little longer:). I planted my watermelon and cantaloupe plants and a little more lettuce, and now–it’s really, really full! Jake spent the night last night, and I’ve been toasting hot dog buns, as the bread seems to have become moldy, made popcorn, cup of noodles, and other “Jake” food. I’ve been reading endless Berenstain Bear stories, and we are now on “The Long Winter,” our 5th Laura and Mary book. Now, I’m having to find true stories about Laura, as well, to read. He can’t get enough. To make it better, his class at school studied pioneers, and they played a copy of one of the old shows for the kids. He was delighted. He knew who Nellie Olson was, as already didn’t like her, so the show was way more fun for him to watch. He made a yarn doll at school, but quickly pointed out that it was different than the one Ma made for Laura. This has been quite a week. I’ve had many, many appointments for the kids, Christmas decorations to put up, school, work and more! We finally gave in and got pizza Saturday night, but otherwise, we’ve done pretty well at keeping it frugal during such a busy week. I was delighted to accept this little artificial Christmas tree from my friend, Harnet. A friend who was moving gave it to her, but she already had one, and offered it to me. 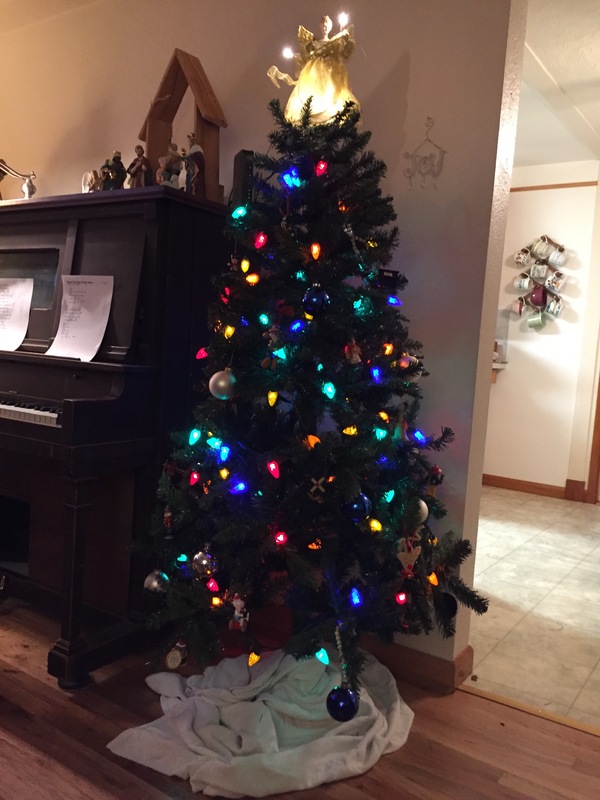 I was especially glad to try it out, because last year I had to put a tree up in the garage, since the living room is so small. 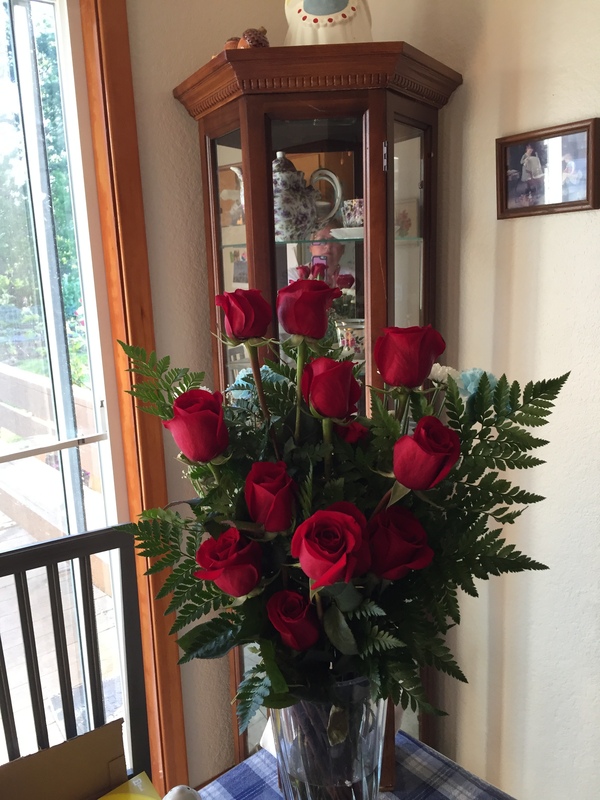 I was not happy with that arrangement, and wanted something better this year. I’ve never used an artificial one before, since I live in Oregon and am surrounded by inexpensive green, live trees, but thought I’d try it out. It works great in the small space I have. We are thinking about getting a fresh one and putting it outside on the deck, with only lights. We will see how far we get on that idea. 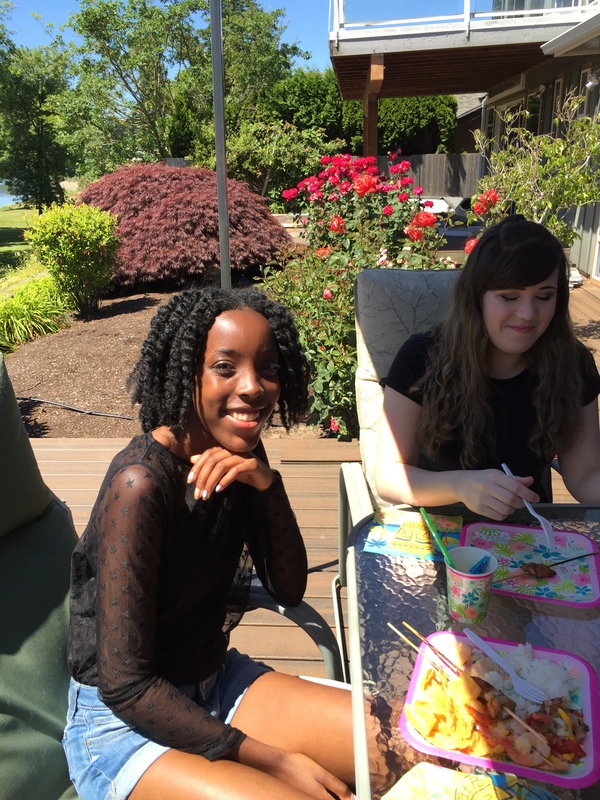 My sister, Rosalie, Ja’Ana and I had a day with Danait and Harnet. 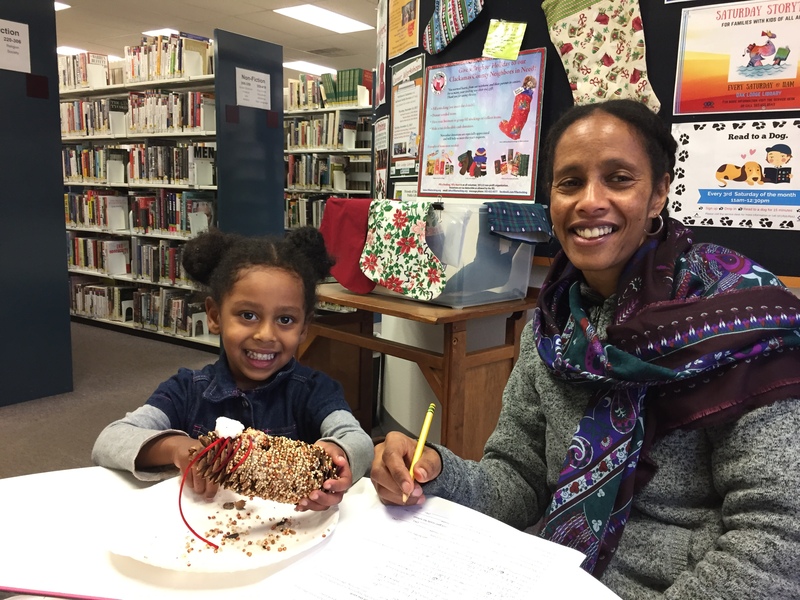 One of the fun, free activities we did was take Danait to the library for a reading program/story time. After story time, they did a craft where they rolled pine cones in suet and bird seed. Rosalie helped her put it outside on her deck when we went back home. I hope some birds come. She was really excited and hoping they would. Harnet wanted to study, so that’s what we did while they did story time. She has tests coming up for school next week, and is a very diligent student. We did over 2 hours of homework that day. We got her Christmas tree up with lots of help from a very excited 3 year old. Harnet wanted to learn how to make tacos, so, while we did more homework, Rosalie ran down and got some tortillas and things to add to what she already had, and I showed her how. We also showed her how easy it was to make quesadillas for Danait from just cheese and tortillas. She loves Mexican food, so was very excited to learn, and sent pictures of Danait happily munching soft tacos today! Now, she has a couple more super easy meals, that they like, to make on busy days, and she knows just what to buy to make it taste the way she wants it. I think we will have to show her about the bulk spice bins at Fred Meyers, since that is the spice Rosalie got. It is clearly the most economical way to get spices, but a little daunting unless we show her exactly which one to get, since all she ever saw was a bulk plastic bag with a little tag–no label, of course. It took me many, many hours (I’m slow when it comes to computers) but I finally figured out how to load the pictures and am now back to being able to take more, and post like I used to. Because the hard drive was gone, there were a lot of programs to get up and running, and a lot of pictures to transfer from my phone, as they were all gone. It’s even better, because now my phone transfers the photos automatically to the computer when I take them. I just kept at it and did not have to beg or pay anyone else to fix it. I’m saving those options for the next big problem:). Hopefully, my blogging will get back to normal this week! 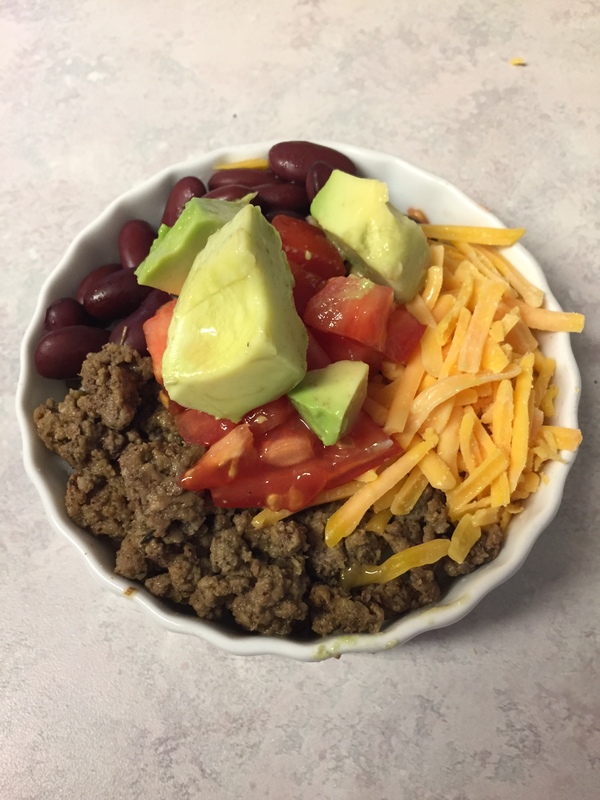 I put together these taco rice bowls from leftovers left through out the week. It felt good to take the odds and ends and make something new. I got some groceries at Grocery Outlet, as it had been about 10 days, and before Thanksgiving before I bought a bunch. The tomatoes and avacados came from that trip, and were very reasonable. They really made the leftovers tasty! I just stocked up on basics–things like carrots and milk, yogurt, and whatever else I needed that was a good deal. I got the shrimp I wanted for Christmas Eve fondue. At that store, things are usually quite reasonable, but you have to grab them when you see them, as you might never see them again! The rest of my needed items came from Fred Meyers, as Grocery Outlet also may not even have some of the things on my list on any given day. The best bargain we got was Rice Krispie treats for 50c/box of 8. Rob got a case and took them to school. We like to get things like that for the classroom where he works, as they use them constantly to reinforce good behavior. We prefer home-made ones, but they are not allowed at school–store bought is what they want, so when we see a good deal, we grab it! The week’s offerings included barbecued chicken a few times, tacos several times, salads, African food (Harnet always sends leftovers as well as feeds us), and crispy chicken strips. We had rice and potatoes, along with frozen veggies as well. And pizza. Yum! This next week is pretty busy, too. It’s just that time of year. But, I have a plan. I want to make some chili and refried beans, for starters, and those favorites will help the week go easier. I’ve got some beans soaking right now, and will put them in crock pots tonight, and deal with them in the morning. 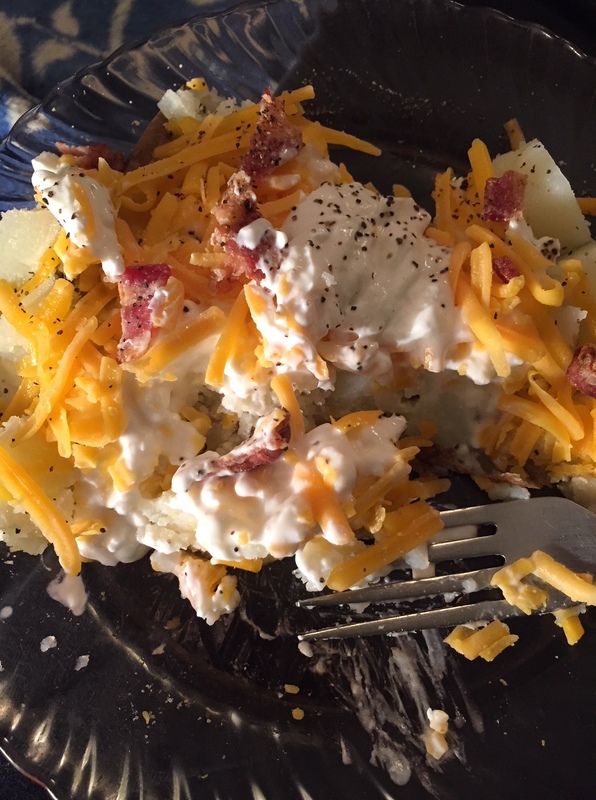 Of course, baked potato bar is always welcome around here!